A rich Conditioner containing natural Chamomile Extract to help gently lighten and brighten your hair. Gentle on your hair and soothing on your scalp. For best results use with Natural Looks Chamomile Shampoo. Suitable for all hair types. This gentle Face Mask cleanses and purifies your skin leaving it soft, fresh and toned. Contains Sweet Almond Oil, Chamomile Extract and Oatmeal. Suitable for all skin types. Apply evenly over cleansed face, avoiding eyes. Leave for 20mins. Rinse off. This gentle Shampoo featuring the natural lightening qualities of Chamomile will help to gently lighten and brighten your hair. The soothing qualities make it ideal for sensitive scalps and frequent use. Suitable for all hair types. For best results follow with Natural Looks Chamomile conditioner. A fabulous floral fragranced vegetable soap to gently cleanse and protect the skin. 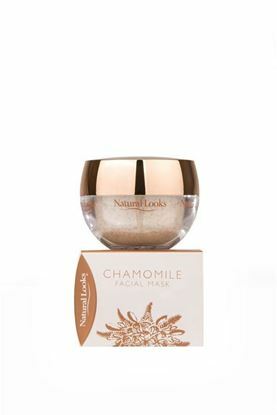 Contains natural Chamomile Flower extract with anti-inflammatory and soothing qualities making it excellent for irritated skin. A gentle Moisturiser with Jojoba Oil and calming Chamomile extract plus a sun protection to help keep your skin looking soft and young. Suitable for all skin types.